Not sure why my iPhone has decided to take smaller pictures. It is something which I must have done inadvertently. Here is Chicken Monday on Tuesday. No doubt I shall be confused about which day of the week it is for the rest of the week. Anyhow, this is comfort food for me. 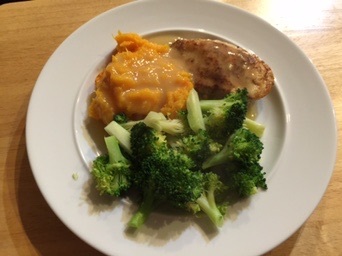 This entry was posted in Poultry and tagged broccoli, butternut squash, chicken dinner. Bookmark the permalink.